Lately I've been noticing girls wearing sweaters with Peter Pan Collars everywhere I turn. You can buy them on the internet here, here, here, and here, or you can make your own like I did! I don't love wearing polo shirts anymore, but I'm loving collared sweaters. 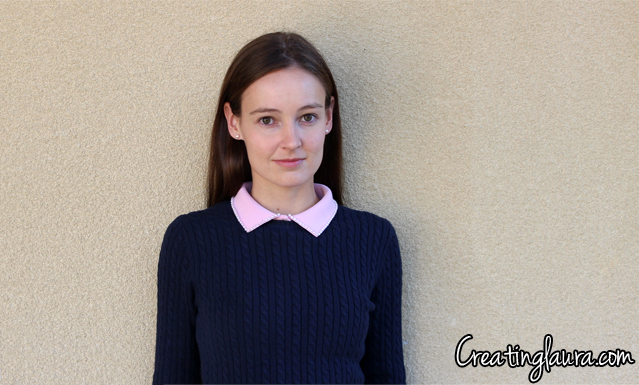 With that in mind, I found an old polo shirt in my closet and I decided to cut off the collar and fix it up so that I could mix-and-match it with any of my sweaters. I didn't buy anything for this project, I just used things I found around my house: an old polo shirt, a plastic necklace from my childhood, a pair of scissors, and a needle and thread. 1. 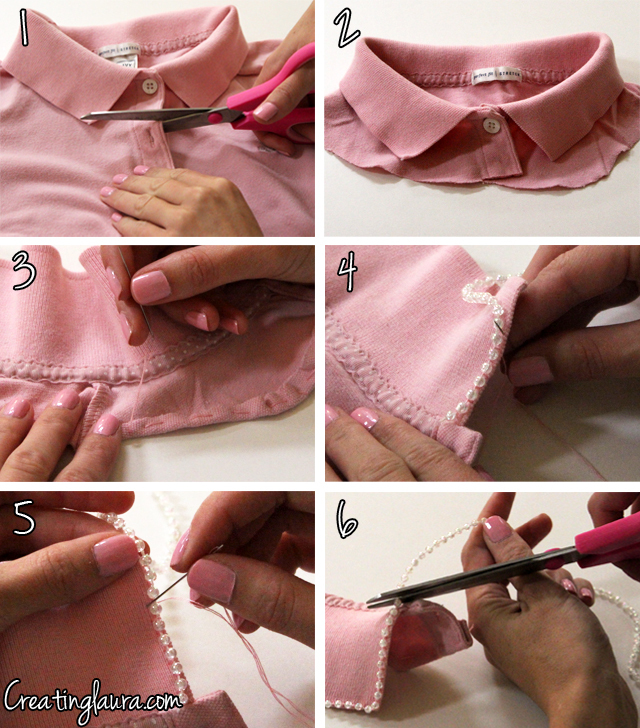 Begin to cut off the neck of the shirt, being careful to leave one button and a couple of inches of fabric below the collar. 2. Cut all the way around until the collar is detached from the shirt. 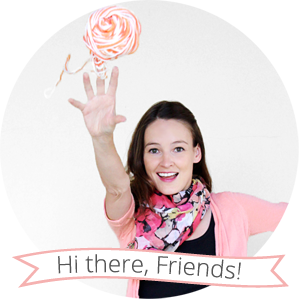 Discard the rest of the shirt (or keep it for future DIY projects!). 3. Fold over about 1/4 inch of fabric along the edge that you just cut and sew a hem. 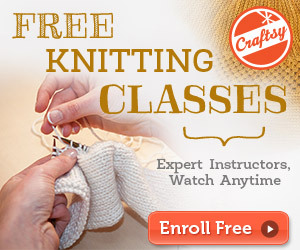 This will stop the fabric from fraying, so it's important not to skip this step. Feel free to do this with a sewing machine if you've got one handy, but you can totally sew it by hand like I did if you want to. 4. Make a cut anywhere in the necklace so it becomes a long string of beads. Lay this string along the edge of the collar and begin to sew it down. 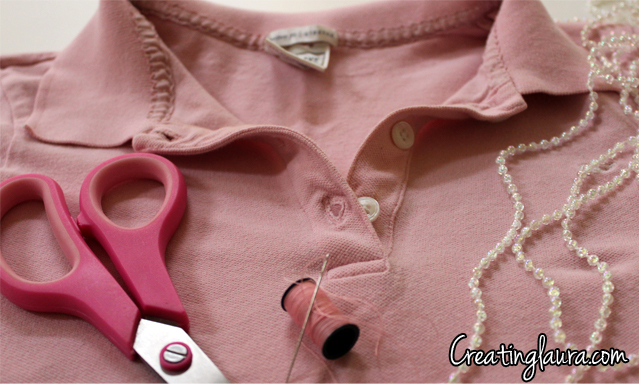 To do the sewing, start by bringing the needle and thread up through the collar as close to the edge of the collar as possible. 5. Pass the needle and thread over the string in between the first and second needs, then insert the needle down through the collar again on the other side of the beads. 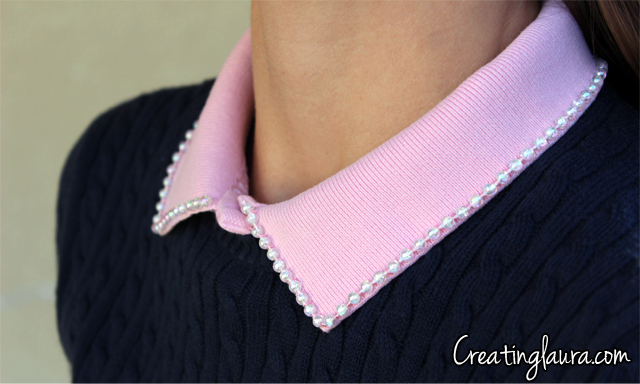 Repeat this sewing method, making one stitch between every single bead until you've covered the entire edge of the collar. 6. Cut off the excess beads to finish the project. Now you can put the collar on your neck, doing up the button to hold it in place, and then pull on your sweater over it, and no one will know that the collar isn't attached to either your shirt or your sweater! 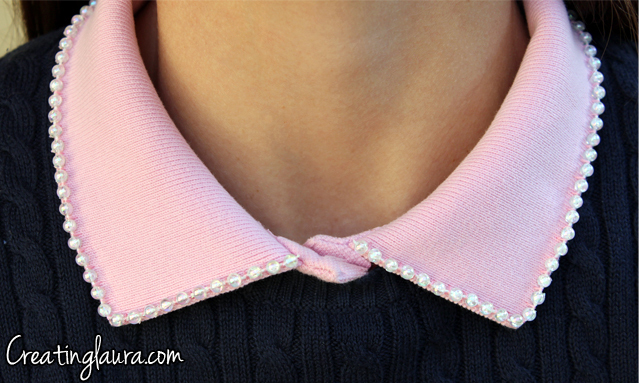 Because this collar is interchangeable, I'm excited to try out all the different sweaters (or dresses!) that I can wear it with. This outfit is only the beginning! I love this! Looks so great.